You might remember that there was some confusion late last year surrounding A Way Out’s release date. Someone claimed to have access to an email list that said A Way Out is coming out in 2019, and then, at The Game Awards, the game’s director Josef Fares put his middle finger up at the camera as the release date for the game was said to be March 2018. Well, that’s all in the past now: Fares has confirmed on Twitter that A Way Out is coming out March 23, and the game has gone gold. More co-op games are just a click away, as we’ve got a list of the best co-op games on PC for you and your friends to get in on. 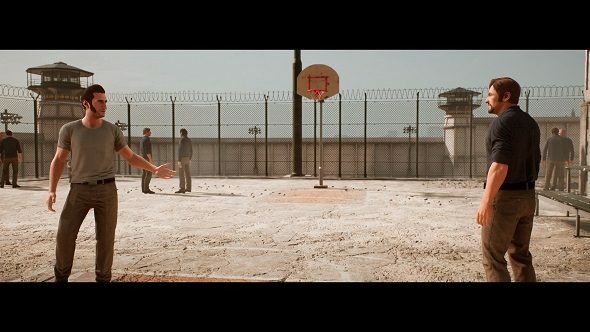 In case you haven’t heard about A Way Out yet, it’s a co-op game where two players, as Leo and Vincent, must escape from jail by working together in a sort-of asymmetrical style. As Leo and Vincent, players will work both together and separately to get past guards, complete objectives, and ultimately get out of jail. You might have also heard of A Way Out because the director, Fares, also directed Brothers: A Tale of Two Sons, which was met with critical acclaim when it released in 2013. This is Fares’ second video game as director, and, in many ways, looks to build upon the designs in Brothers: A Tale of Two Sons. The game is going to launch on PC, Xbox One, and PS4, and is available through Origin. If you’re playing in online co-op, though, only one player has to own the game, the other can join in and play through the full game using the free trial, if you’re in co-op, which is a nice way to ensure you’ve got a pal to escape prison with.